We’ve got the blues. 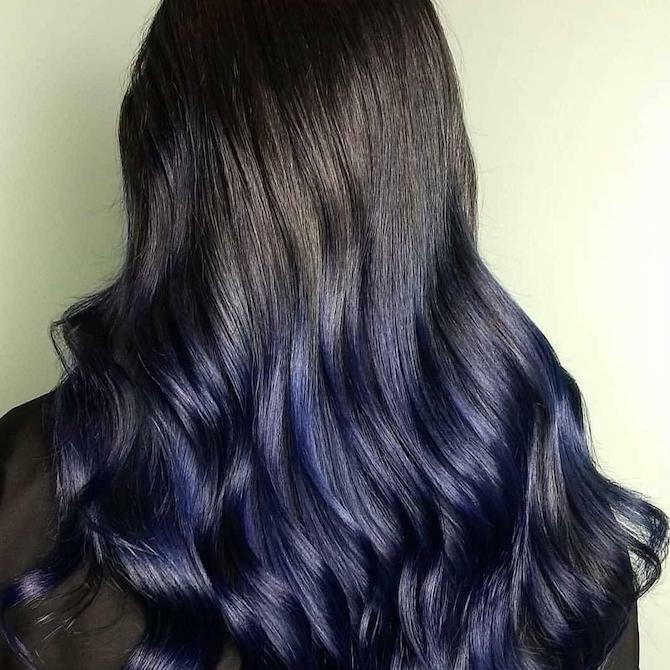 Not the “ugh, it’s February” kind of blues, but the “we want blue hair and we want it now” blues that can only be fixed with a salon session. 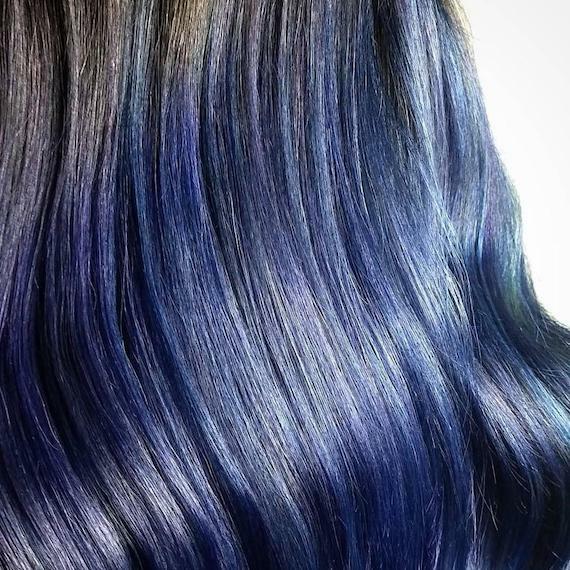 Having spotted Lady Gaga, Kylie Jenner and Ruby Rose all trying ocean-inspired hues on for size, we’re hardly surprised that dark blue hair and blue black hair are trending right now. Take note: it’s really tricky to get blue color out of light blonde hair, so you or your client need to be sure you’re ready to commit to this statement trend. If it’s a yes, work by the same principle you follow for every light-to-dark transformation, gradually layering the pigment up to achieve a deeper tone. Then, apply Color Touch 2/8 as a high-shine, blue black top coat. It’s an intensely inky, demi-permanent shade that fades evenly over a long period of time. 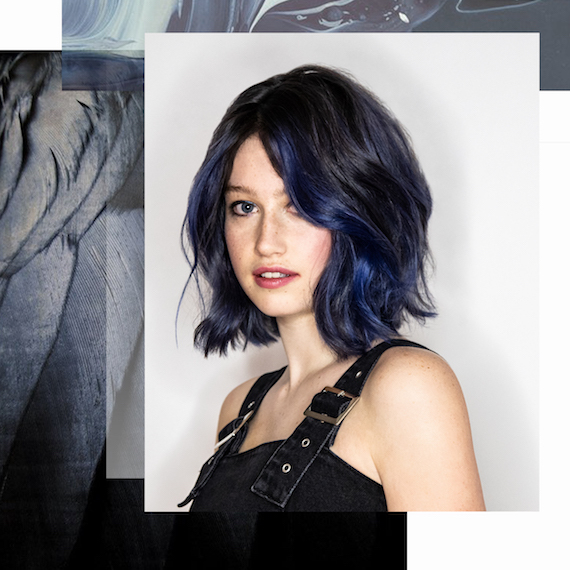 As for those who aren’t quite sure about going ultra-dark, a pastel blue color melt is a good compromise that allows you to test-drive the trend. Through light mid-lengths, paint on ribbons of our semi-permanent Color Fresh CREATE in New Blue and Super Petrol, both diluted with Tomorrow Clear for a softer, subtler finish. Be prepared to layer. After pre-lightening red locks with Blondor Powder, the hair will have an orange undertone that, when blue is applied over the top, will neutralize to a gray. To achieve the subtle oil slick finish that only the best blue black shades boast, layer in yet more of a blue, like Color Touch 2/8. This is the easiest transition. If hair is already a medium brown shade, you can simply apply a blue black shade over the top, like our purest permanent color Koleston Perfect ME+ Special Mix 0/88. For a multi-tonal effect, combine with panels of a true black, such as 2/0. That said, brown hair with a lot of warmth in it (think, golden-yellow tones) runs the risk of turning green when a blue color is applied over the top. To counteract an olive tint, add a little purple to the blue-black formula. Special Mix 0/66 is a true violet that, when mixed with 0/88 will give a pure blue end result. 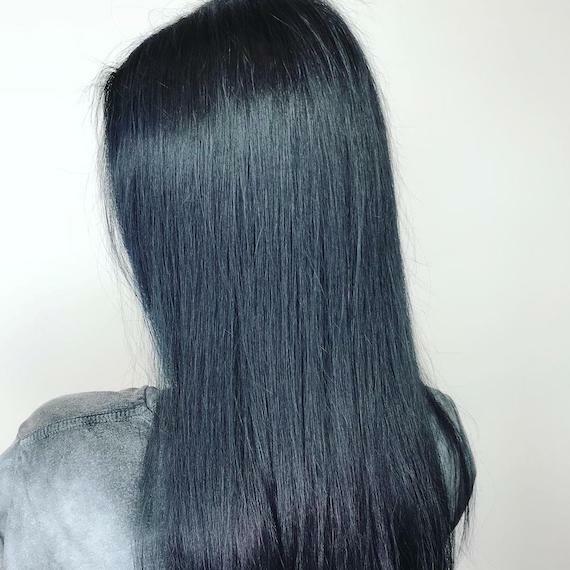 You might think adding blue black to almost-black hair would be a pretty simple process, but putting blue over the top of dark locks can actually result in a flat, murky finish. Instead, pre-lighten panels and tone with one of the above true blues. You’ll achieve a shade-shifting, reflective hue that shimmers under the light. 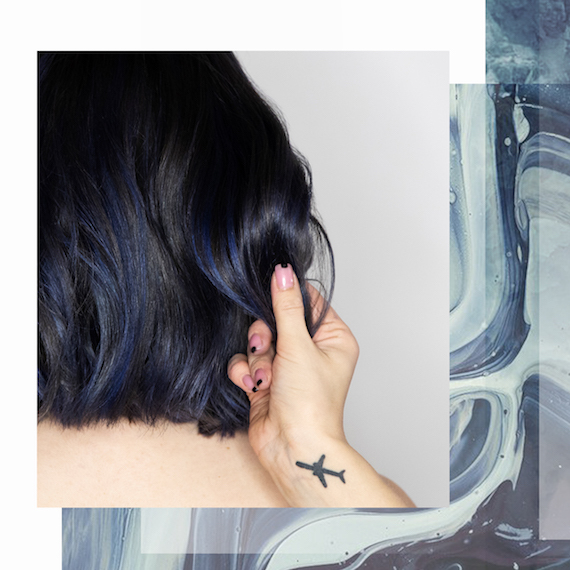 To keep dark blue hues true, recommend a post-color haircare regimen to your clients that incorporates INVIGO Color Brilliance Color Protection Shampoo, Vibrant Color Conditioner and a twice-weekly dose of the Vibrant Color Mask. They could also try the Brilliance Booster; a vitamin E-infused emulsion you apply to clean, damp hair before conditioning, leave in for five minutes, then rinse to supercharge the effects of your routine. If they are prone to heat styling, make sure they’re also armed with a good heat protector. EIMI Thermal Image is perfect, as the lightweight spray safeguards locks from the damaging effects of tongs while nourishing the hair. Finally, the gloss-boosting EIMI Oil Spritz makes light work of adding shine to hair. Mist into palms of hands and smooth over the surface of hair to make blue tones shimmer. Looking for more hot hair trends? Head to the @WellaHair Instagram for endless inspiring looks, or check out the Wella Hair Pinterest board for tips and tricks you won’t find anywhere else.